1: Leyton Stadium has history tracing back to the 1870's when it was home to inaugural FA Cup Winners 'The Wanderers' It was initially known as 'The Hare & Hounds Stadium' owing to its proximity to a local pub of the same name. For a short period, it was also known as the Leyton-Wingate stadium, following a merger between two local sides. 2: Like many sides from this part of the world, Leyton had a very complicated history with mergers and splits all over the shop. The original Leyton club was established in 1868, playing mainly in the Athenian League and being regular participants in the 'proper' rounds of the FA Cup. 3: In 1975 they merged with Wingate FC to become Leyton - Wingate. This club continued in the Athenian League, joining the Isthmian League in 1982. Starting at Division 2 level they stayed here for 3 seasons before 2 promotions in 3 seasons saw them promoted to the Isthmian Premier in 1987. They had their highest ever finish of 7th in 1990 before being relegated the following season. Other notable successes under this banner included an appearance in the FA Cup 1st Round, reaching the FA Vase Quarter Final and getting to the FA Trophy 3rd Round. 4: They reverted to their original name in 1992 after dropping the 'Wingate' suffix. This incarnation of the club saw 3 mid-table finishes in the Isthmian Division 1 and an appearance in the FA Cup 4th Qualifying Round. 5: In 1995 Leyton merged with Walthamstow Pennant to become Leyton Pennant. They stayed in the Isthmian Division 1 until 2000 when they were relegated to Division 2. A couple of years later, reorganisation meant that a 6th placed finish was good enough to see them earn a place in the restructured Isthmian D1 North. 6: This changed their name to Waltham Forest in 2003 and currently play in the Essex Senior League following their relegation in 2013. They now play at Wadham Lodge and had been struggling for a number of years before their eventual relegation. 7: Meanwhile a new Leyton FC were formed in 1997, winning a court case in 2002 to become the official continuation of the original Leyton FC. They initially played in the Spartan South Midlands Division 1 South, transferring to the Essex Intermediate League in 1998. They finished as runners-up in their first season and joined the Essex Senior League the following season. 3 seasons were spent here with them becoming champions in 2002. 8: They joined the Isthmian League at Division 2 level for the 2002/03 season. Their run of success continued and 2 straight promotions saw them start 2004/05 in the Isthmian Premier. That season proved to be the most successful in the reformed club's history with a 5th placed finish. The success was not to last however as after 2 mid-table finishes they were relegated in 2008 after finishing bottom of the league. 2 and a half more seasons of struggle were spent in Isthmian D1 before being forced to withdraw from the league in January 2011 after they did not pay their subscription fees. 9: The team's woes can be partly attributed to the jailing of their chairman Costas Sophocleous and former owner Philip Foster for their parts in a £16M VAT Fraud. This left the club struggling financially, resulting in its eventual closure. 10: Since leaving the stadium it has fallen into ruin, with no new tenants taking it over. Its latest use was as a car park, with vehicles all over the pitch. A rare Saturday off from watching Wycombe allowed me to make the trip over to East London to watch AFC Wimbledon's game at Leyton. As per usual with AFC Wimbledon games I went with my mate Paul who supported the Wombles along with Liverpool, Rangers and his main love, Wycombe Wanderers. We drove over to East London with the traffic being kind to us for once and we arrived at the ground with nearly 2 hours until kick off. That was even after stopping to look at various grounds along the way including London Colney, Potters Bar, Cockfosters and Waltham Forest. To kill time we had a look around the area and went in the Hare & Hounds pub for lunch and watched whatever game was on the TV. For such a lowly team, Leyton made a good fist of things, more than playing their part in an entertaining 2-2 draw. Wimbledon went ahead on 20 minutes following a penalty awarded for a push in the box and Karl Beckford did the honours with a low effort to the left of the keeper. Biily Bricknell equalised for the hosts just before the half-hour with a close-range finish but it was Wimbledon who continued to have the better of the game. It would take something special for Leyton to go ahead and that certainly happened 6 minutes into the second half when Sammy Winston netted a 25-yard screamer. They couldn't hold on however, and just before the hour, Beckford equalised for the Dons with his second spot-kick of the afternoon. 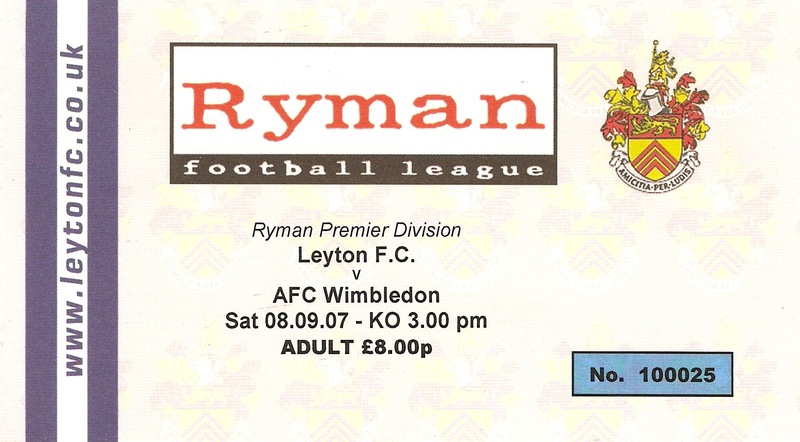 LEYTON STADIUM was a ground that saw much development in its latter years and by the time of its closure was a venue that could have graced the Conference had the football on the pitch been good enough to see them promoted. The ground was situated behind the Hare & Hounds pub from which it took it's name and had an impressive modern looking glass entrance. The ground was also very well kept and had plenty of covered seating and standing with an overall capacity of around 2,500. It was situated in a densely populated area with plenty of passing trade and local residents, so it was sad that they could not attract the support to sustain them. With this there were also plenty of takeaways and a number of pubs nearby so you had plenty of choice pre match.